The city of Kamloops sits at the confluence of the North and South branches of the Thompson River in South Central British Columbia. In fact, the name Kamloops comes from the Shuswap word “Tk’emlups”, or the “meeting of the waters”. Kamloops is about four hours northeast Vancouver, east of the Coast Mountains. Summers tend to be hot and dry, while winters are mild and short. 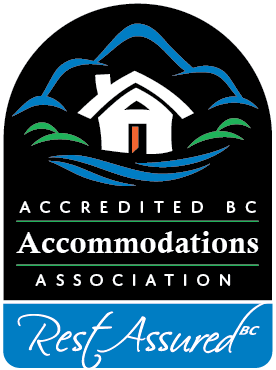 In short, a stay at a Kamloops Bed and Breakfast is sure to be enjoyable. The area was inhabited exclusively by the Shuswap (Secwepemc) First Nation before the first European explorers arrived in 1811. Shortly thereafter, Kamloops became a trading post; it became an important stopping point along the Hudson’s Bay Brigade Trail, which connected Astoria with forts and gold-rush towns in New Caledonia. Kamloops grew yet more once the Canadian Pacific Railway reached this part of BC in the 1880s. Golf aficionados most certainly know Kamloops; thirteen golf courses are open much of the year, and offer spectacular views of a vast, rugged landscape. Once snows start to fall, there is excellent skiing (downhill and cross country) and snowboarding. Sit back and enjoy a sleigh ride, or head off to explore on a snowmobile. There is ice skating, ice fishing, tubing and toboganning. At the end of the day, plenty of cafes, pubs and restaurants offer warmth and refreshments; then curl up next to the fire in your Kamloops Bed and Breakfast. There is no shortage of Arts and Culture in Kamloops. Spend an afternoon at the Kamloops Museum and an evening at the Symphony. Attend the Kamloops Cowboy Festival in March for a taste of Cowboy Poetry and Music. Check out the three-day Kamloopa Pow Wow in August – one of the largest celebrations of First Nations culture and heritage in Western Canada. And all are invited to the Kamloops Festival of the Performing Arts in early spring. 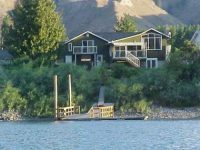 This Kamloops waterfront Bed & Breakfast is located directly on the South Thompson River just minutes from downtown Kamloops. Chose one of 4 suites with either queen or king bed with private bathroom, and enjoy beautiful riverfront views as you relax in luxury and comfort.